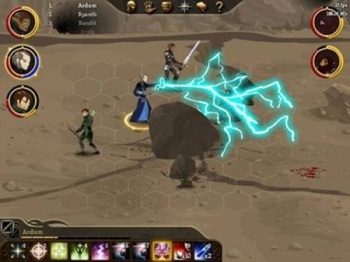 Dragon Age is planned to hit the flash-based browser scene sometime before the release of Dragon Age: Origins in November. If you haven't gotten enough Dragon Age after reading the novels and playing the pen-and-paper game, and you've already created your character and watched the launch trailer, EA 2D, a company whose "mission [is] to create blockbusters for the browser" has got something new for you to chew on (wasn't that sentence link-tacular?). Dragon Age Journeys: The Deep Roads is a flash-based tactical browser RPG set in the Dragon Age universe and created with the support of BioWare. In development since November 2008, The Deep Roads will be the first of three currently planned chapters, and is set for release in October according to the official website, where you can watch a pretty neat trailer too. I could have put the trailer here, but I like this screen better because it shows that the game is hex-based, rather than some kind of action-adventure title like it appears to be in the trailer. When it comes right down to it, details on the gameplay are still scant, but we should find out more very soon. We do know a little bit about the story though: it will cover the "dwarven city of Orzammar and the Deep Roads surrounding it where the dwarves face a persistent threat from the darkspawn hordes." The leading force behind The Deep Roads is Daniel Stradwick, creator of the excellent flash rpg series Monster's Den. Art and animation has been created by the illustrious Adam Phillips of Bitey Castle fame. Additional programming is being done by Andrew Sega, who created the Magic the Gathering inspired flash card games Mytheria and the multiplayer Armor Wars. The story is being penned by first time game writer Marcelo Poppi. You'll learn more about them and the talented team at EA 2D in future posts. If Dragon Age: Journeys is half as cool as EA 2D's logo, I'm sold.